Little did I know back in February when I wrote, “Sugar: Poison we love”, that a new film was coming out May 9th called FED UP. There are 600,000 food items in American supermarkets and 80% have added sugar as an ingredient. If trends continue, 95% of Americans will be overweight or obese in two decades. It is expected that by 2050, 1/3 of Americans will have diabetes. Research published earlier this year also suggests that Canadians eat too much sugar. In 2014, the average Canadian will eat nearly 110g of sugar a day or approx. 27 teaspoons. The World Health Organization recommends no more than 6 teaspoons. You need to check your labels and understand what sugar is. Watch our for ingredients such as corn syrup, or corn syrup solids, dehydrated or evaporated cane juice, fructose, fruit juice concentrate, flucose or anything usually ending in “ose”. A lot of “Sugar Free” foods have ingredients called sugar alcohols in them such as maltitol and sorbitol. These are generally worse than real sugar. Generally, naturally occuring sugars found in fresh fruit and veggies doesn’t count as bad sugar and I certainly don’t feel guilty mowing down on a slice of watermelon or snacking on carrots. I haven’t seen the film yet but I have to admit that some of the posters and trailers highlight terrible information. How sad is it that children today are the first generation who are not expected to have a longer life expectancy than their parents? Yet, let us please maintain some sense. Check out this poster that is featured on the films FB page. 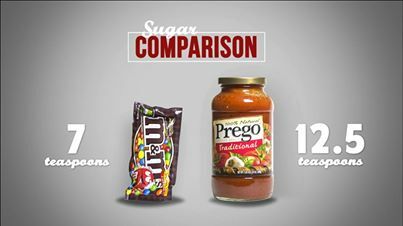 While the sugar content illustrated is likely true, how many of us will actually sit down and eat an entire jar of spaghetti sauce in one sitting or even one day?! It’s not a great example although you might wonder why any sugar at all is needed in spag sauce. If you are at all motivated, it is very easy to make your own home-made sauce with a can of chopped tomatoes, some onions, garlic and almost whatever veggies you have sitting in your crisper drawer (grate up a carrot, chop up some celery and zucchini, spinach, peppers, mushrooms….). Just toss them in a pot (or crock pot if you’re really lazy), simmer them up and then blitz them. That said, there is some tinny weirdness about canned tomatoes that seems to go away when you add less than a tsp of sugar – opps…there I go adding sugar. Well, at least it’s better than corn syrup or flucose. And 1 tsp is certainly better than 12.5 tsp. I’m sure there will some information in this film that will make me crazy because it will be over the top or perhaps even misleading BUT it is good that it will support a dialogue about healthy eating. Hopefully it will come to a theatre near me and I’ll get a chance to check it out soon. Coming Soon: Research I’ve been working on has disturbed me…stay tuned to learn more about IUU & the international seafood industry. Next Post Fall is the season for Parnsips!